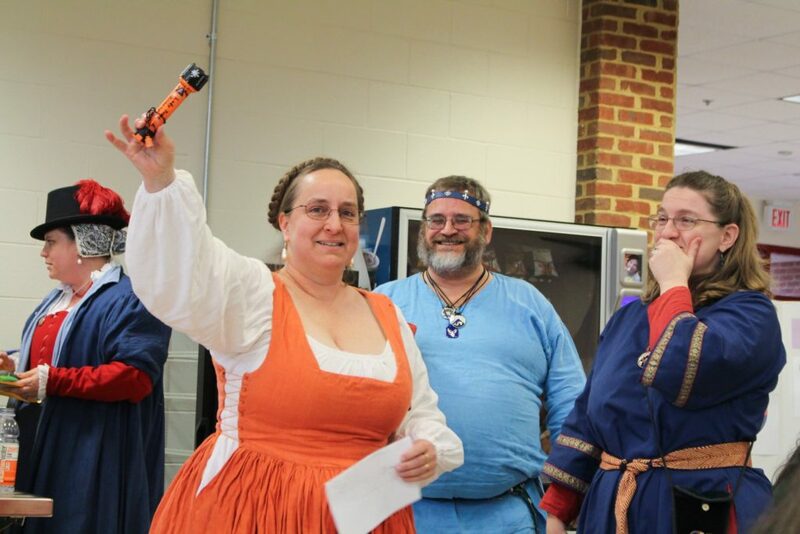 At the Atlantia University’s 100th session this Saturday, February 2, 2019, I officially passed the torch of leadership for the Atlantia Performing Arts Guild to Lady Jeane Kilmeny! Vivat! SCA Guilds are unofficial organizations, similar to households, that are created and managed by the people invested in them. Like so many aspects of the SCA, you get out of it what you put into it. After 3+ years of re-energizing this guild, I felt it was time to pass on leadership, and Kilmeny accepted my invitation. She is a fountain of great ideas, new energy, and stuff I never would have thought of. I will still pitch in, especially for technical support for this blog and the Google resources we’ve been using for sharing information within the guild. And now, the buck stops with the magnificent Kilmeny. She will serve our community well, and I’m thrilled to pass this torch to her. Below is the introduction of Kilmeny I gave the audience at University’s convocation yesterday. Many thanks to Mistress Adriana for allowing us time during the convocation to do this business. 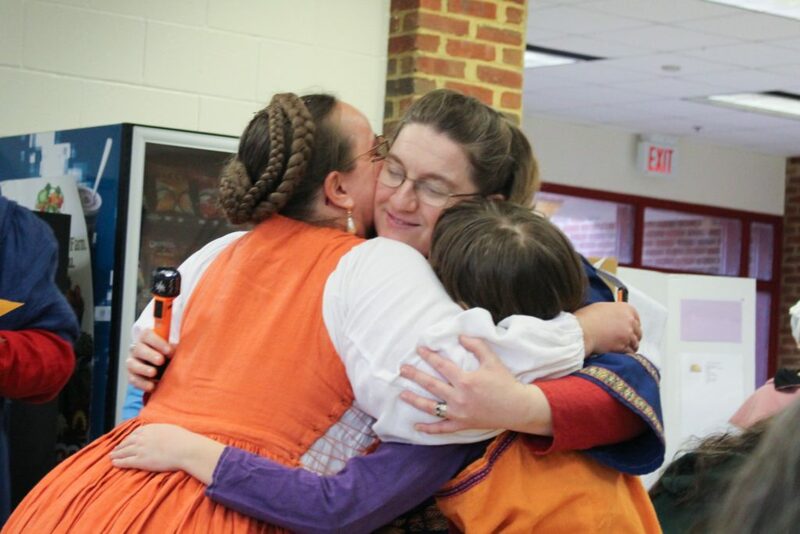 Bards are the foundation of Performing Arts in the SCA. 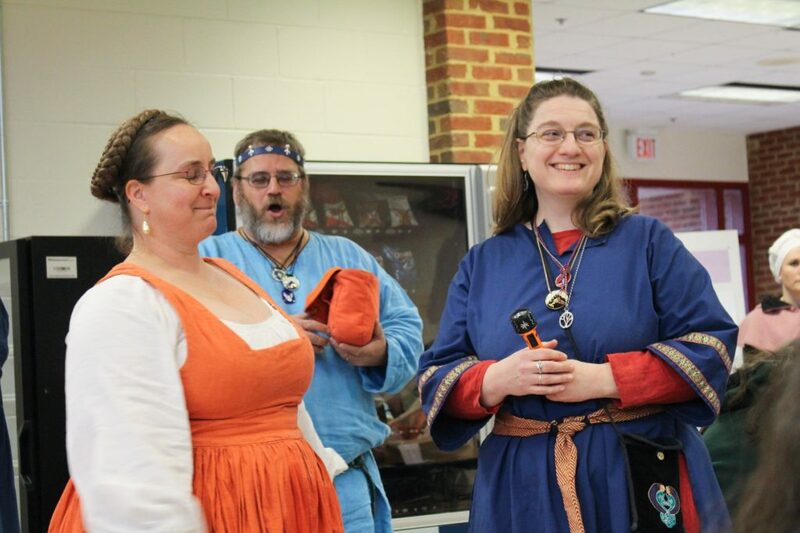 Bards were the first ones to create space at SCA events for a person to take the stage and sing. Blossoming from the bardic foundation, many other performing arts have found space in the SCA: vocal, instrumental, solo, groups, theater: both scripted and improvised, commedia dell’ arte, storytelling, magic, sword dancing, and many more. Kilmeny gets the job done with passion, accountability, and empathy. She works successfully with a wide variety of people, including special needs folks, and all the crazy wacky people all of us SCAdians are. She’s a mother of 2 and has been playing in the SCA for over 20 years. She pays attention to individual needs and balances them with the needs of the community making the SCA experience better for all of us. She is reliable, holds herself accountable, and has a mischievous sense of humor. At University alone, she started taking classes in 1994. She started teaching here in 2002. She has served many times as Autocrat, Nastycrat, Children’s Activities Coordinator, Performing Arts Coordinator, she’s fought heavy weapons, she sings, and she can teach you a ton about Irish culture! Lady Jeane Kilmeny now has the torch!